Be on the lookout for these regional spring/summer tree and plant diseases! 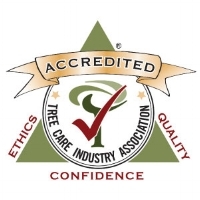 Click to learn more and contact a certified arborist at Nels Johnson Tree Experts if you have any questions about your own trees and plants. Diplodia tip blight is a fungal disease that kills the tips of the branches of pines, and less frequently spruce and firs. In the blight stage, it can cause severe dieback and the fungus can grow into the stems and main trunk where it becomes a canker disease. What to look for: A few brown needles at the tip of the current season's growth is the first evidence of tip blight. Boxwood blight is a serious fungal disease that kills boxwood trees and shrubs. The blight typically spreads when people acquire infected bushes or trees and then plant them alongside or in place of their existing, healthy boxwoods. What to look for: Spotted leaves, stem cankers and defoliation. The spots usually appear as light- or dark-brown, circular lesions that are often surrounded by a large yellow halo. Apple scab is a disease of apple and ornamental crabapple trees that attacks both leaves and fruit. Severely infected leaves become twisted and puckered and may drop early in the summer. What to look for: The fungal disease forms pale yellow or olive-green spots on the upper surface of leaves. Dark, velvety spots may appear on the lower surface. Cedar-apple rust is a fungal disease that requires juniper plants to complete its complicated two year life-cycle. From year to year, the disease must pass from junipers to apples to junipers again; it cannot spread between apple trees. Where to look: Junipers, apple and crabapple trees. What to look for: Pale yellow and orange pinhead sized spots on the upper surface of the leaves shortly after bloom. Heavily infected leaves may drop prematurely. Junipers experience large stem cankers that ooze when wet.